Salix have the facilities to contract grow turf using the VMax range of Turf Reinforcement Mats (TRMs). VMax C350 or P550 is used as the reinforcement element within the turf giving unprecedented scour protection performance. This high performance product has been successfully used on projects nationwide, including large scale flood defence embankments, spillways and asset protection schemes. These permanent Turf Reinforcement Mats (TRMs) provide long term erosion protection and vegetation establishment assistance while permanently reinforcing vegetation. All our TRMs are built around a permanent, non degradable three dimensional matting structure and consist of either 100% synthetic components or a combination of synthetic and natural materials. Shear Stress Turf C or P is a unique pre-vegetated scour solution typically used in areas where forces exerted by water exceed the shear limits of unvegetated TRMs from day one of installation. Applications include high flow channels, stream banks, shorelines and spillways where rock rip rap, articulated concrete blocks and poured concrete were once the only suitable alternatives for erosion protection. 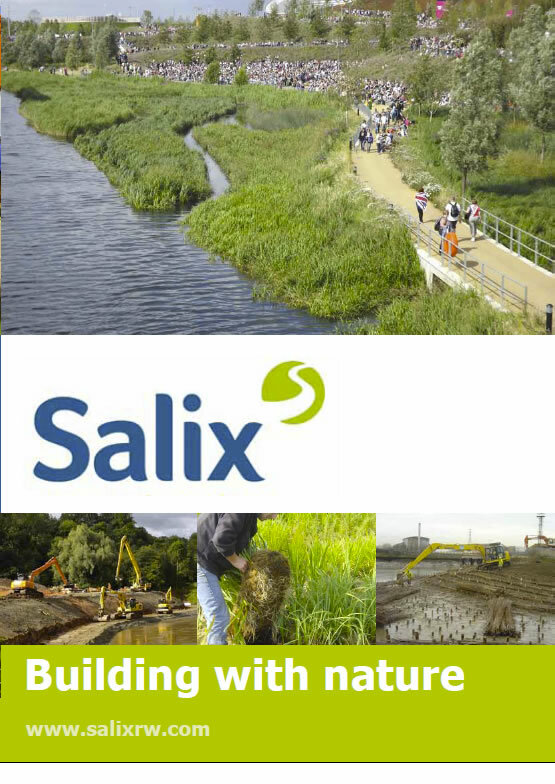 Salix are the UK distributor for all VMax soil erosion control products including biodegradable and permanent solutions. The VMax range has undergone extensive independent flume trial testing in the States.